In the previous days, we talked about a jailbreak tweak that enables users to see quick launch apps in their Control Center. Similar to CCMore, Keek is another jailbreak tweak that extends in functionality while providing utility to access quick launch apps in the Control Center. Keek simply integrates with the Control Center and allows you to interact with apps easily. For instance, if you have used the calculator app, you can simply interact with it on the same interface. Keek’s extended functionality narrows down to the access and interaction with recently launched apps. You can interact with the app in the Conreol Center as well as view it in full screen. Keek is a pretty handy app when it comes to launching your apps, since you don’t have to look around and navigate to them. It is time saving and very easy to use. Let’s see in a little more detail for what Keek has in store for users. Other than providing easy access, Keek also allows users to add another row of icons. The new row of icons will be added below the quick launch apps in the Control Center. Users can interact with the new row of icons using swiping gestures. All you have to do is navigate through the apps using left or right swipe gestures and tap the app icon to open it. It’s easy and it’s pretty useful for apps that you use everyday. 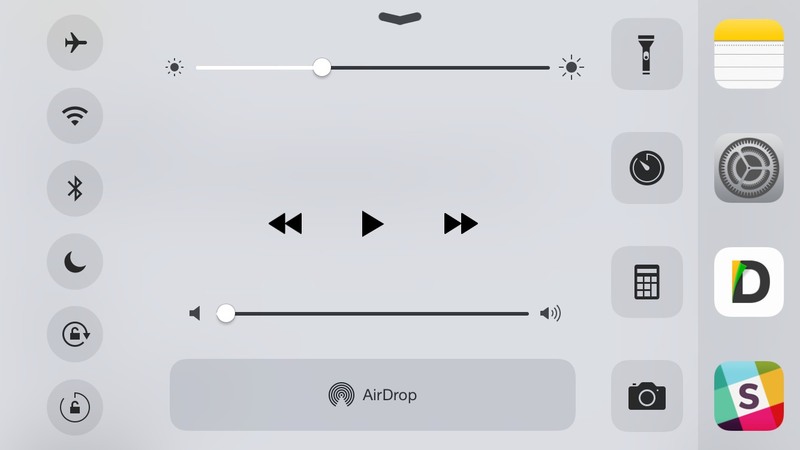 Opening the app would enable it to expand fully in the Control Center where you can easily interact with it. Another important feature that we talked about earlier is Keek’s ability to expand apps in the full screen view. If you want to access apps in the full screen view, simply tap the button with an upward arrow. Once you do that, the close button allows you to exit the full screen mode. Keek only functions if your device is unlocked. This means that if you have any personal information set in any of your apps, it will not be accessible from the lock screen. 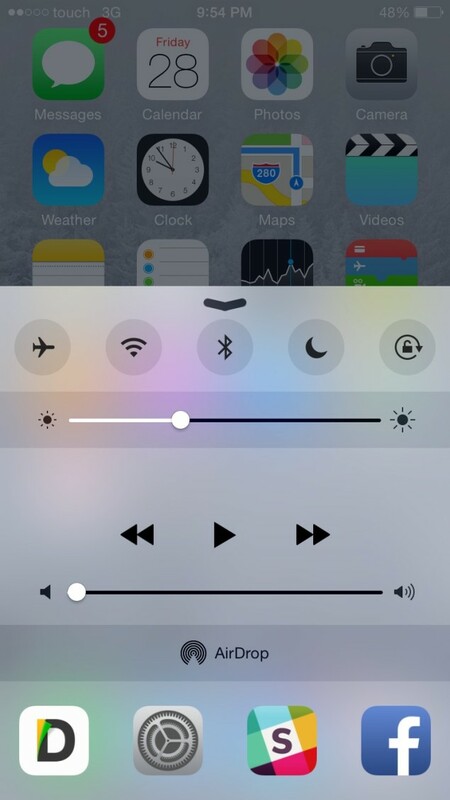 The tweak comes with its own set of configuration options which can be accessed from the stock Settings app. In the configuration options, you can completely enable or disable the tweak. You also have the availability to choose the size of icons showing in the Control Center as well as opting for the number of apps shown per page. 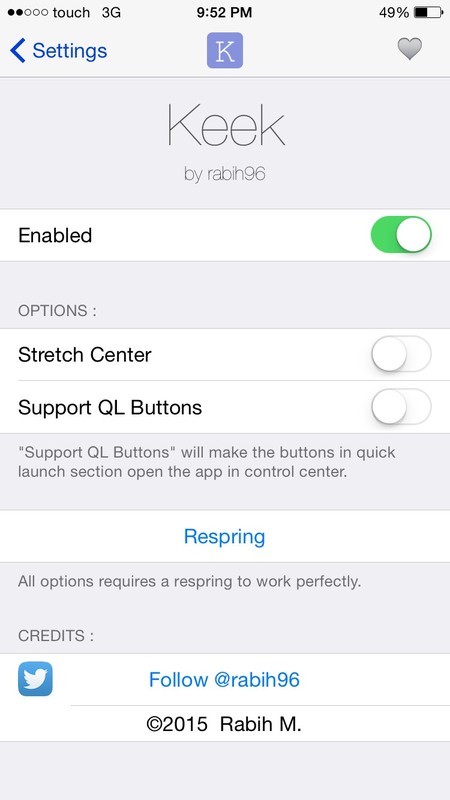 The toggles located in the configuration options allow users to enable or disable the ‘Stretch Center’ while the ‘Support QL buttons’ allow users to view quick launch apps in the Control Center. Keek is a bold app that extends its functionality beyond the CCMore tweak. The tweak is available on Cydia’s BigBoss repo for only $1.99. If you have a jailbroken device, we would totally recommend you to give this tweak a whirl. This is it for now, folks. Share your thoughts on Keek in the comments.